I like a little snitching escapism while I work and, as I work mostly from home, I can listen to whatever I want, thank you very much. Like everyone else who was a child in late 1980's/early 1990's, I have OF COURSE read every Roald Dahl book, and had already decided to spend my free monthly Audible credit on one of his works due to unexplained sudden onset nostalgia (USON). The sole reason I chose 'Matilda' over any other delicious Dahl delight was because Kate Winslet was the narrator and, as she is perfectly phizz-whizzing in everything else, I had no doubt she would read it most rambunctiously. 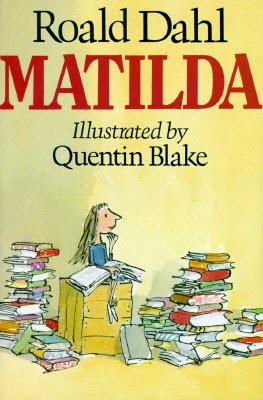 'Matilda' was also always the Dahl book I warmed to the most on first read, as I was an odd, bookish sort of child myself, and I find that my favourite books are always the ones in which I can jumbly goggler myself as the protagonist. For those of you who haven't read the book, go and read it immediately, you are never too old for Roald Dahl, or, even better, listen to this whoopsy-wiffling audiobook, because Kate Winslet is more talented and lovely than your inner monologue, I promise. The book itself, for the uninitiated, is about a bright young girl who loves to read, and takes pleasure from learning and looking after herself, despite her awful family and scary school. More importantly, it is about individuality, thoughtfulness, breaking free, and being a good person. Even more importantly, while authentically covering these themes and conveying these emotions, the book has a lovely, dark, scrungy, filthomeness to it, that all kids love, and all adults seem to forget about. No health and safety here thank you, we are too busy splatch-winkle squilching our superiors and being frothbuggling with our friends to care. The audiobook (have I mentioned Kate Winslet narrates?) is all of these things and more. Vitally, Kate Winslet 'does the voices' so, so well, and adds a Britishness to the whole affair that, for me, is an important part of the book that often evaporates when all Roald Dahl books are translated into film/audiobook. There is no gloss or sheen here, despite Kate Winslet being 'all Hollywood' now, with her 'Mr. Wormwood' being particularly gloriuptious. Every time she did a new voice I just though, "God you are bloody good Kate, really bloody good". I also think there can be a tendency for children's/young adult books to be narrated a bit too 'Jackanory' for my tastes, but there was not a ham in sight with our Kate. Re-reading the book and listening to the audiobook makes me realise the true talent of Roald Dahl. The writing is so odd, original and clever, and so eccentrically, darkly British; it really is beautiful to read. I forgot how old fashioned and British it was, possibly because the American film version is actually rather lovely too, and if anything my USON only got worse after listening/reading. This un-review was brought to you by my the child inside me and the fluffbunglishness of Gobblefunk (the Dahl Dictionary). Read this book if: you are a (or have a) child who like to read/you are a (or have a) child who doesn't really like to read (yet)/you are a (or were a) bookish oddity who likes their own company/you or your child like the books of Neil Gaiman or David Walliams (Dahl is better)/you need to feel better about people and the world for just a second. Listen to this audiobook if: you appreciate good acting/ you parents (or now you) did crappy voices to good books/you like Roald Dahl in any capacity/you are British and grew up in the 1960's-1980's/you want something people of all ages will appreciate/you haven't smiled in a while.